Olof "olofmeister" Kajbjer is a Swedish CS:GO player, formerly a Counter-Strike 1.6 player. He plays as a rifler and AWPer for fnatic. He is notable for his boost on de_overpass in a match against Team LDLC.com at DreamHack Winter 2014. As a child, he actively played soccer until the age of 15, when he sustained a knee injury that prevented him from playing for one year. He transitioned into playing Counter-Strike 1.6 and brought his competitive spirit with him into his professional career. He won a couple of online 1.6 tournaments and attended a few smaller LANs, but it wasn't until 2013 when he began making a name for himself in CS:GO after signing with LGB eSports. 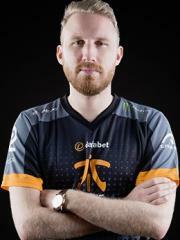 On June 30, 2014, olofmeister joined fnatic, where he found immediate success making it to the semi-finals of Gfinity G3 and a 2nd place finish at ESL One Cologne 2014. Fnatic continued to dominate the scene, and were the favorites going into DreamHack Winter 2014. After advancing to the playoffs and faced against Team LDLC.com, olofmeister was involved in a controversy where he was boosted by his teammates on de_overpass into an illegal position which helped his team win the map; a position he was unaware of being illegal. Fnatic would later forfeit the map and withdraw from the tournament. In 2015, olofmeister and the rest of fnatic continued their success, winning ESL One Katowice 2015, the first major championship of the year, and winning two consecutive major championships in a row with a victory at ESL One Cologne 2015. On November 12, olofmeister's long-time friend and former teammate Dennis "dennis" Edman replaced Markus "pronax" Wallsten on fnatic, and the team continued on to win the three remaining major tournaments of the year: FACEIT DreamHack Winter 2015, Fragbite Masters Season 5, and ESL ESEA Pro League Season 2 Finals. olofmeister's success continued into 2016 with a victory at the Starladder Starseries XIV and IEM X World Championship 2016. Following a quarter-final placement at the MLG Major Championship in Columbus, Ohio, fnatic announced that olofmeister would be taking a break from competitive play due to repetitive strain injury on his hand and would temporarily be replaced by Niclas "PlesseN" Plessen. olofmeister is currently ranked #88 in highest overall earnings, and #4 in highest earnings for players from Sweden. The largest cash prize that olofmeister has been awarded from a single tournament was $100,000.00 from ELEAGUE CS:GO Premier 2017 on October 13, 2017. His 1st place finish makes up 12.61% of his total prize money won. olofmeister obtained $100,000 in total prize money earned on June 15, 2015 with a $4,000.00 cash prize from his 1st place finish at DreamHack Summer 2015 (CS:GO). Prize money from 50 tournaments got him to that point. olofmeister has won $52,200.00 in prize money from 6 tournaments within the last 90 days, $26,700.00 (or 51.15%) of which came in the last month.